I am a self-taught electric guitar and amplifier builder in the Baltimore-Washington DC metro area. I discovered this artform over a decade ago and continue to refine my skills. I build guitars from a wide variety of woods including ash, alder, mahogany, cocobolo, ebony, yellow- and purpleheart, padauk, and zebra wood. My work has been featured in the Baltimore Sun, Johns Hopkins Magazine, and I won the 2009 Sudler Arts Prize, the top award for excellence in the arts, at Johns Hopkins University for my lutherie. 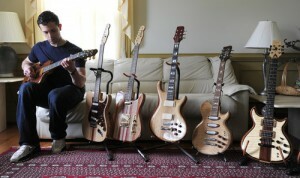 Your guitars are absolutely beautiful, Paul. Your work is impeccable!!! Thank you, Tammy! I added the ‘Share’ button as you suggested. Awesome site Paul. Keep up the good work bro! Paul!!! Congrats on putting up a website! Now the world gets to see your completely gorgeous guitars. I’ll be sure to point people in this direction. I am very pleased with my “White Serena” guitar. In addition to the impeccable craftsmanship and beauty, it is comfortable to hold and play. The sound is crystal clear and balanced. It’s a treasured part of my collection.